Every day thousands of TMPro customers start the TMPro software. At the start they always see the startup screen of the software. You can place your advertisement on the startup screen. This way the customers can easily reach you. All TMPro customers around the world see your picture when they start TMPro software – all continents, all countries, no limitations. 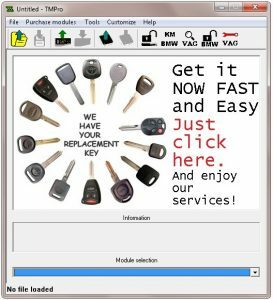 When customer clicks on picture, software redirects to link provided by you. It is not nesecarry TMPro box to be connected, picture is always visible at starting. With each customer on each new start of software picture is changing to next from the list of pictures. Total number of pictures is 9. New picture can be again your picture and link to it. You get instant statistic – how many times TMPro software has started with your picture(s) and how many times users have clicked on it. Also in your web server statistic you can track clicks made from TMPro screen. Size of picture must be 480×300 pixels JPG format. Picture is visible till begin of work with TMPro. Picture must be approved by me. Prices start from 10 Euro per day per picture.Discounts for more pictures and bigger period. 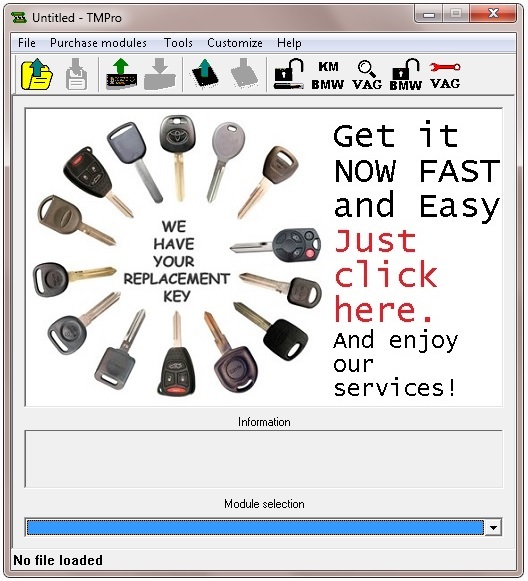 Advertising on the TMPro software startup screen is THE FASTEST WAY locksmiths to find you! Your “adv shot” is always in the target – locksmiths from all over the world! It is because only locksmiths are TMPro customers. Why not to try?